Ages 5 through 12. 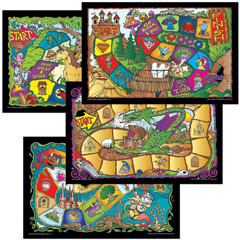 Help children become "story wizards" as they develop narrative language skills using the activities in this fun game activity kit. Students are asked to respond to questions about stories and to create their own stories. Items on the task cards challenge students to describe story characters, sequence events, make predictions, create story titles, distinguish fact from fiction, etc. As students participate in the activities, they embark on adventures with dragons, knights, wizards, space creatures, and other interesting characters. All activities can be presented orally to students with limited literacy skills. Skills emphasized include sequencing information, completing sentences with information relevant to story events, describing events and characters, making comparisons, using correct grammar, and asking questions. Includes four full-color game boards.